The perfect combination of brains and brawn — the BHP is controlled by a true POWERMANAGEMENT® MICROCONTROLLER. 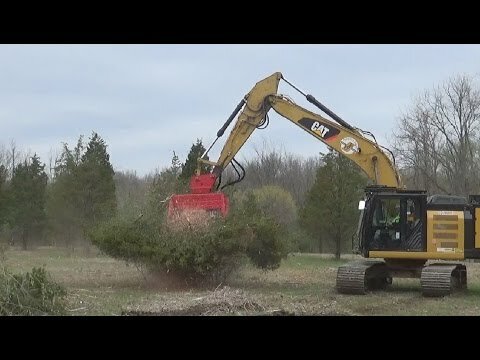 This feature gives all of the available power to the brush cutter. There is no power loss due to accessories. The performance of the BHP and brush cutter is maximized at all times taking full advantage of the maximum horsepower of the Power Pack. The microcontroller manages the head flow, engine and hydraulic needs in real time. This system captures the full potential of grinding power and delivers superior performance when compared to other power packs. Serious power for maximum performance. Fecon® offers a range of Power Packs for your excavator. A power pack is a dedicated power source for any application where more hydraulic horsepower is desirable. A 20 Ton excavator (or larger) can benefit from the BHP270. Typically you can provide 45-60gpm to the attachment from a 20-30 Ton excavator’s hydraulic system, the BHP 270 can deliver 105 gpm. On the job site, it all comes down to hydraulic horsepower:gpm (flow) x psi (pressure) / 1714 = hydraulic horsepower.